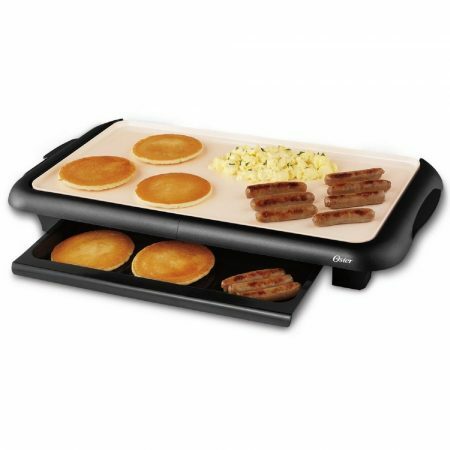 An electric griddle is one of those appliances that is key to have in the kitchen. Having the ability to cook in large amounts on demand is one of the greatest things about owning one. They also enable you to dive into different recipes. With something that provides such benefits, you’d think they would be a pain to move from one spot to the next but due to their size and plug and play ability, they store easy. So it’s safe to say a griddle won’t be clogging up your kitchen anytime soon. Being an extremely convenient household appliance, you can bet your bottom dollar that electric griddles come in all shapes and sizes. Finding that perfect griddle can be difficult. 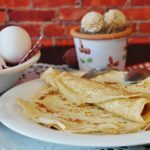 Due to this, I’ve constructed this guide to aid in your quest in finding the best, affordable griddles to date. For those who want to be quick, here is our top recommendation today. The Black + Decker Family Sized Griddle is very affordable, very stylish (really stylish!) and is perfect for a small family. Not only is it all around a great product, but it’s Amazons Best Seller. Thickness is key, some foods require less thickness on the plate than others. For instance, cooking finer things such as eggs on a thin plate will cook much better and more efficiently than on a thick one. At the same time big beefy steaks will cook much better on a thicker plate, just make sure to save us some for later. Whereas you may be thinking of griddles which are just one big flat surface, you can actually get sectioned griddles which enable you to cook foods without touching each other, neat right! No more will juices combine to give you that funky aftertaste. 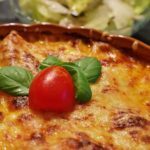 Grids are important, but what’s also important is to ensure that the grid can also be removed or reversed, to provide you with that one big flat surface to cook in one type of food in bulk. Not only is cooking efficiency important, but the maintenance of cleaning the griddle can be a game changer, make sure you look for a non-stick surface for that pain-free cleaning period after your stomach’s full. Simple but important, cord length is a key feature in any appliance, and power outlets can be placed in various places around the room. So it’s vital to buy a griddle that allows you the freedom to use it in the specific place you have in mind for it. Amazons best seller, and with reason. With a quality build, this griddle is not only simple but comes with a minimal yet modern style and at an attractive, affordable price; this product is a real bang for your buck. Enabling the ability to cook a wide-range of foods and being embodiment of griddle simplicity you’ll be excited to get cooking when this arrives at your door. But don’t worry, with a plug and play feel, you’ll be cooking in no time. With an added bonus of a non-stick plate, being dish washer friendly and having a small, easy to clean dip tray. The griddle provides ease after you’ve had your fill and it’s time to clean up. Perfect for a simple, family griddle. That really gives you a simplistic and stress free cooking session. Without a doubt, if you’re cooking for a small family and are looking to quickly plug this in, cook and then clean it all in a flash, then the Black+Griddle might be one to add to your shopping list. Making it to the top of our list is no easy feat, but sometimes simplicity and style is what you need to get to the top of the ladder. You remember the grids we talked about right? Well The Hamilton Beach griddle specialises with convenience, why cook one thing at a time when you can cook two, or three? 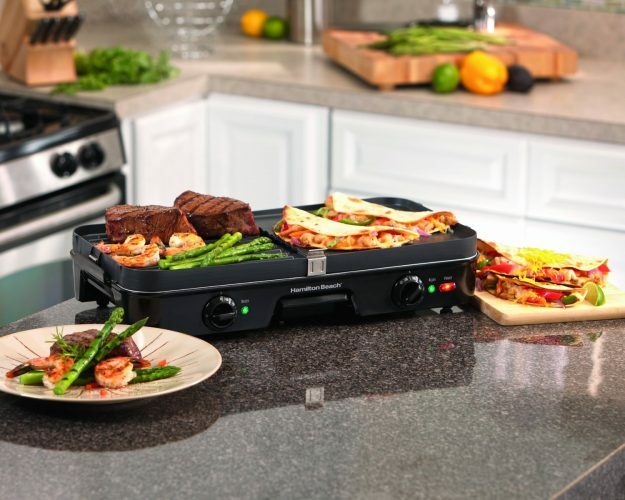 The Hamilton beach griddle, with it’s 3-in-1 functionality is designed for the busy, it enables you to cook a wide-range of foods from delicate foods such as steak and pancakes to more heavy-duty foods such as steaks and meat roasts. With grids included, you can switch to and from different modes on the griddle providing the ability to handle many different cooking situations. If you’re looking for something with a-bit more options and complexity, whilst being efficient and effective with cooking, then this Hamilton Beach griddle might be a match made in heaven. The Presto Electric Griddle is the king of being compact, but it should be with such a large surface. 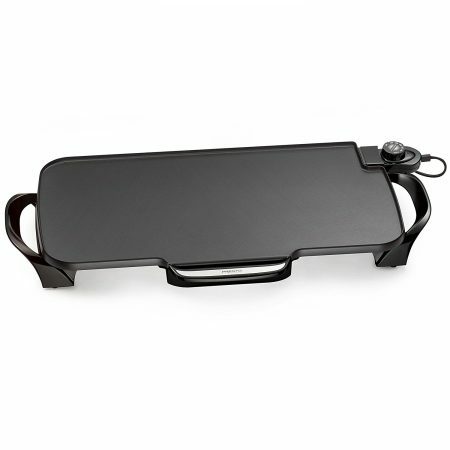 If you need a large surface aka, you’re cooking a banquet then this griddle is perfect for you needs. One may worry, that the griddle will cause an issue when being stored, but this griddle has a secret weapon. Removable handles allow you to store the griddle within many places around the house hold (just don’t store it under the bed). Not only does it specialise in being compact, but it also comes with a premium non-stick surface, assuring you an ease clean-up after a hard cooking session. 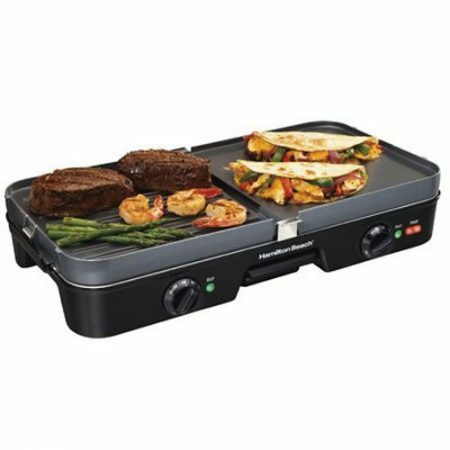 So if you’re looking for a powerful and high quantity griddle, then look no further then the Presto Electric Griddle. Cooks a tonne, easy to clean and stores away oh-so nicely. As you’ve noticed the majority of our list today are griddles where you’ll turn the food over every once and while. Well it’s time to change that. 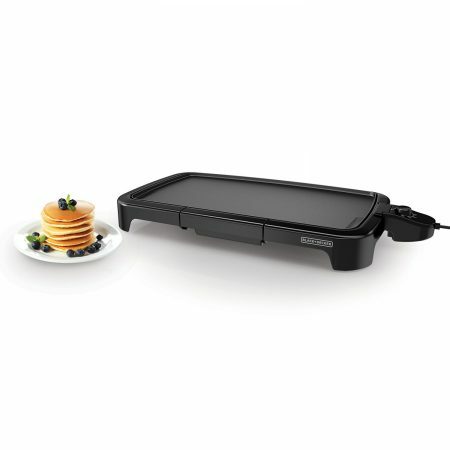 The Cuisinart Griddle comes with a top plate also, meaning that you need to press and check to cook your food. 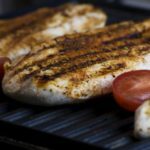 It doesn’t not only conquer the standard grilling world but also the griddle one too. With some high-tech temperature control and indicator lights, the Cuisinart grill allows you to master cooking various dishes that require various temperatures. The griddle also stretches fully out to give you the standard style of griddle we’ve been looking at in previous products on our list. If that’s not tempting enough, a scraper tool and some gourmet recipes come free with the griddle. 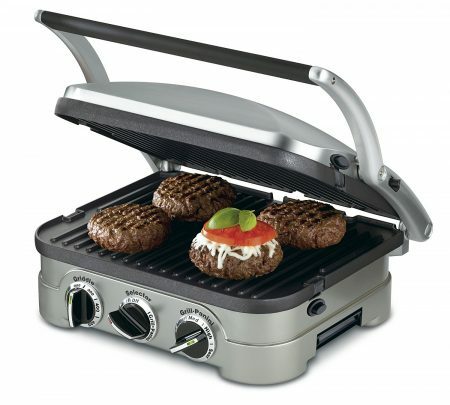 Cuisinart is one of the best in the grilling and griddle world. With it’s 5-in-1 capabilities it can provide you with an answer for any of your grilling needs, if you’re looking for a beastly griddle with an extremely high quality build, then the Cuisinart-Griddle is a must-buy. So you’re husband or wife are coming home and you need to prep a full meal using your regular Electric Griddle, but you soon realise you’ve cooked meat too soon and you need to chuck something else on the griddle before you’re done? What could help you in this situation? Well, the Oster griddle provides you with a unique solution. Armed with a “warming tray” the griddle allows you the convenience of placing your food on it’s tray whilst you cook the next batch. The Griddle also comes with a DuraCeramic non-stick surface, meaning that it lasts much longer without any form of peeling or damage, although it’s said cleaning can be slightly tougher with this. All in all, with it’s unique solution to serving and it’s durable non-stick surface. 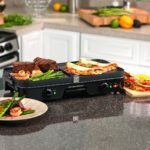 The Oster Griddle could be a perfect solution to your cooking needs, and does it while looking extremely unique.